A.D. 1035. This year died King Knute at Shaftesbury, on the second day before the ides of November; and he is buried at Winchester in the old minster. He was king over all England very near twenty winters. (Anglo-Saxon Chronicle). 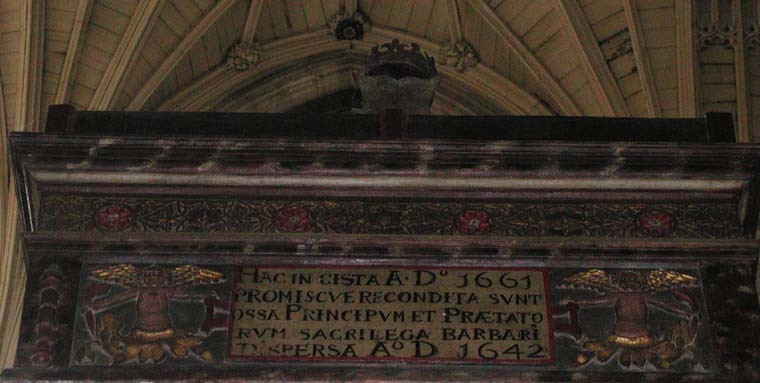 His remains are in a mortuary chest perched high up on a stone screen in Winchester Cathedral. Canute the Great (Knud den Store in Danish) was both the greatest Viking and the greatest ruler of Anglo-Saxon England. He re-conquered England after the death of his father Sweyn Forkbeard and ruled in 1016-35 A.D. as an Anglo-Saxon king with the Anglo-Saxon nobility and people. He married Emma, the widow of the previous king Ethelred. His empire covered England, Denmark, Norway, parts of Sweden and overlordship in Scotland. At the Holy Roman emperor's coronation in Rome, Canute was at his side. The legend of his failing to repel the tide while sitting on a throne at the seashore is first related by Henry of Huntingdon (1084?-1155). Canute's purpose in this was to demonstrate the vanity of earthly powers in the face of heavenly power. 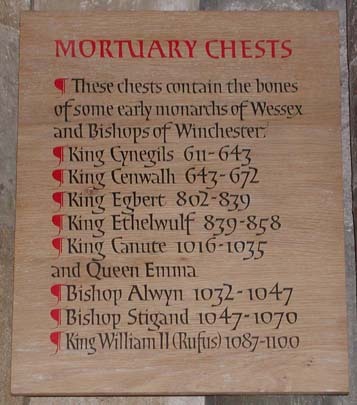 There are six chests containing the bones principally of Anglo-Saxon kings and prelates - see list in photo of plaque above. The chest with Canute and Emma has inscriptions front and back in Latin (last two photos). 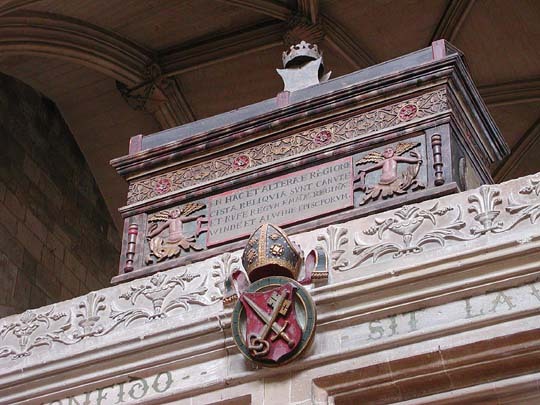 According to the inscription on the front, the chest contains, additionally, bones of the Norman king William Rufus and two bishops. Probably. 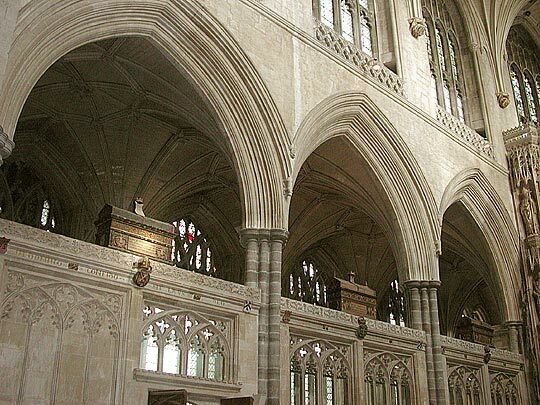 It is related that during the civil war in the 1640s between Parliament and King Charles I, the puritans ransacked the chests and scattered the bones about the cathedral. They were re-gathered in 1661 after the restoration of Charles II, as stated in the inscription on the back of the chest (last photo). 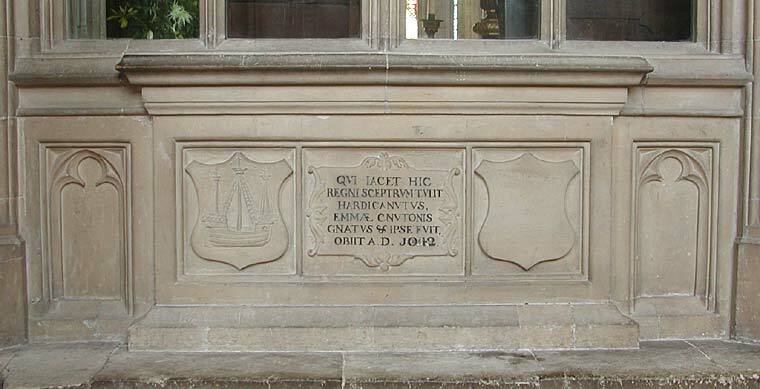 But there was clearly still some uncertainty - so the chest opposite has been given exactly the same inscriptions! 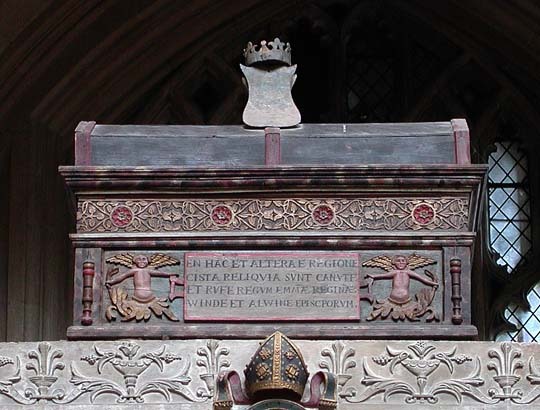 The chests and screens on which they stand are of Early Renaissance design from Bishop Fox's time (died 1528), although the relics were collected long before. Contemporary picture of King Canute and Queen Emma ( Cnut and Aelfgyfu) giving a cross to New Minster, Winchester, contained in the Liber Vitae of The New Minster and Hyde Abbey, Winchester, written c.1031 by the monk Aelsinus.